Updates come and go, but when it comes to Photoshop CS5 and CS5 Extended, Adobe put forth a Herculean effort to improve both functionality and user experience. This release brings the much-anticipated 64-bit compatibility to the Mac version of the image editor, as well as hundreds of feature requests from the Photoshop community at large. For example, you can now drag and drop files from your desktop into an open Photoshop document (they land on their own layer), change the opacity or fill of multiple layers at once, save your favorite layer style settings as defaults, and more. Other enhancements include a redesigned Refine Edge dialog box whose new Smart Radius feature makes selecting things like hair and fur easier than ever before; and an improved Lens Correction filter that utilizes camera profiles that you download or create yourself. Merging multiple exposures into one also got easier with the new Merge to HDR Pro option, and the list goes on. Add it all up and you’ve got an upgrade that’s not only worth the cost, it’s one you can’t afford to skip. To say that the programming team had its hands full in making Photoshop 64-bit compatible is an understatement—the program had to be rewritten from the ground up. For end users, this means Photoshop can now open and edit super-huge files—those over 4GB—as well as utilize more memory (RAM), the latter making the program feel zippier. However, the speed increase is barely noticeable if you’re running OS X 10.5 (Leopard), though more so in OS X 10.6 (Snow Leopard). That said, if you’re the proud parent of one of the newest Macs (with faster video cards), the program should run faster. Unfortunately, to accommodate the new programming code that allows for 64-bit processing, some plug-ins and filters—the built-in Variations and Lighting Effects, for example—only work in 32-bit mode, and that surely will disappoint some users. Moreover, most third-party plug-ins too will work only in 32-bit mode, until they are updated. Thankfully, it’s easy (though not especially convenient) to switch between the 32-bit and 64-bit versions of the program; just select the application icon, choose File->Get Info, turn on the 32-bit option, and relaunch Photoshop. Another exciting new feature is the much-improved Refine Edge dialog box. It now sports several options for refining selections and makes selecting tough stuff (such as hair and fur) incredibly easy. For example, the new Smart Radius option detects the difference between soft and hard edges and the new Decontaminate Colors option all but eliminates any leftover pixels from the object’s original background. You can also control the destination of the new selection—the current layer, a new layer, a layer mask, a new layer with a mask, a new document, and so on—from within the Refine Edge dialog box. You also get seven preview options, instead of five. Photographers will appreciate the upgraded Lens Correction filter and its new home: It leapt out the Distort filter category into the main level of the Filter menu. The Lens Correction dialog box now lets you download (or create your own) specific camera and lens profiles so its distortion-removing voodoo works better—and the annoying grid option is off so you can actually see your image while you’re tweaking it. 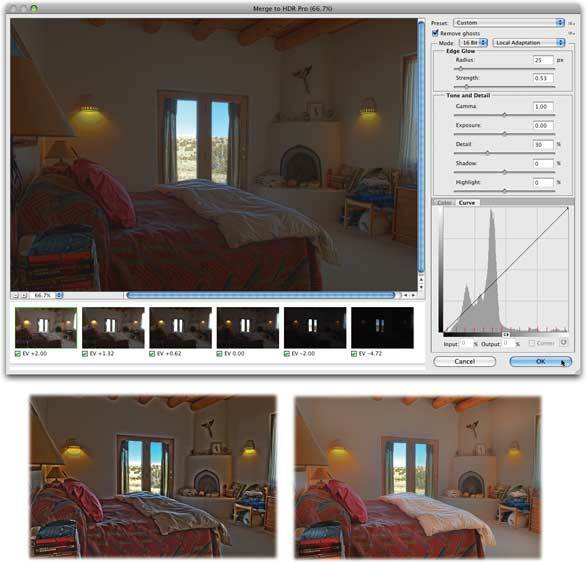 The camera and lens profiles are also used by other features, such as Auto-Align Layers, Merge to HDR Pro, and PhotoMerge for panoramas. If you’re a fan of HDR photography—taking multiple exposures and merging them into a single image—you’ll love Photoshop CS5’s new Merge to HDR Pro dialog box. Not only was the HDR feature redesigned so it’s easier to use, but it includes several useful presets for creating beautiful images right out of the box. The programming code was revamped so Photoshop merges your images faster, and a de-ghosting option was added, which is helpful if something in your image moved or shifted between shots. You can also apply HDR settings to normal images by using the new HDR Toning option in the Image->Adjustments menu, though don't expect to create much more than a high-contrast, grunge look similar to the movie 300. The newest version of the Camera Raw plug-in now includes better noise reduction for zapping grain introduced by shooting in low light at a high light sensitivity setting (ISO). Other enhancements include more options for adding post-crop vignettes (such as a soft, darkened edge) and improved sharpening that pays attention to an image’s tone, contrast, and fine details. Photoshop’s painting engine got an overhaul in CS5, which improves performance anytime you’re using a brush cursor, no matter the tool. The new Bristle Tips feature makes brushes behave like their real-world counterparts, letting you create more natural paint strokes. A new Brush Preset panel lets you see what the new bristles look like before you use them, and the new Mixer Brush lets you mix colors right there on your Photoshop canvas. You can even determine how wet the canvas is, how much paint you’re mixing from canvas to brush, and how many colors you want to load onto your brush tip. There’s even a brush-cleaning option that doesn’t involve turpentine! You can also change brush size and hardness with the same keyboard shortcut: Control-Option-drag horizontally or vertically respectively. And if you’ve used the Rotate View Tool to spin your canvas so it’s at a more natural angle, your brushes won’t rotate. Just don’t expect the new brush behavior to kill Corel Painter ( )—Photoshop’s brush improvements are in their infancy and will take some time to blossom fully. Other painterly improvements include keyboard shortcut access to a “heads-up” version of the Color Picker (it appears atop your image, sans dialog box), making it easier to swap color while you’re painting; improved support for graphic tablets (like the option to have tablet settings override brush settings); and a new sample ring for the Eyedropper Tool, which shows the current and new colors, making it easier to grab the color you want. If you ever need to move your subject’s arms, legs, or tail into a better position, the new Puppet Warp tool can get it done. You begin by dropping markers (called pins) onto the item you want to move, and then Photoshop generates anchor points, handles, and a grid-like mesh that you use to move and distort the item. It works with pixel-based layers as well as Smart Objects. Unless you frequently need to move a model’s arm or leg, or adjust a road or path so it’s more or less curvy, you’ll rarely use this feature. Photoshop CS5 Extended users will enjoy the new Repoussé (pronounced “Rep-poose-ay”) feature, which lets you create 3D versions of a variety of 2D items such as text, paths, layer masks, and selections. It creates a 3D layer that you can use with Photoshop’s full arsenal of 3D tools. Don’t expect it to be a quick process, though; no matter what Mac you have, Photoshop requires some time to perform the 3D extrusion. Other 3D features include the new Ground Plane Shadow Catcher, which gives you an easy way to generate a realistic shadow cast on the ground (or, in this case, mesh) beneath a 3D object. Photoshop CS5 also sports faster 3D Ray Tracer rendering (think of Ray-Tracing as tracing the path of light rays reflected off an object and back to the camera for a more photorealistic image), which lets you render a selection, pause and resume rendering, and change render quality. Adobe also added a slew of new materials, light sources, and overlays, the ability to change 3D depth of field, new 3D preferences, and more. If you’re upgrading from Photoshop CS4 ( ), the workspace doesn’t look much different than before, though the Tools panel icons have been modernized. Also, the Application Bar includes a live workspace switcher (they’re really buttons) that you can drag leftward to reveal and hold several saved workspaces. In fact, the Hand and Rotate View tools were removed from the Application Bar to make more room for this feature. You can also delete built-in workspaces you’ll never use. 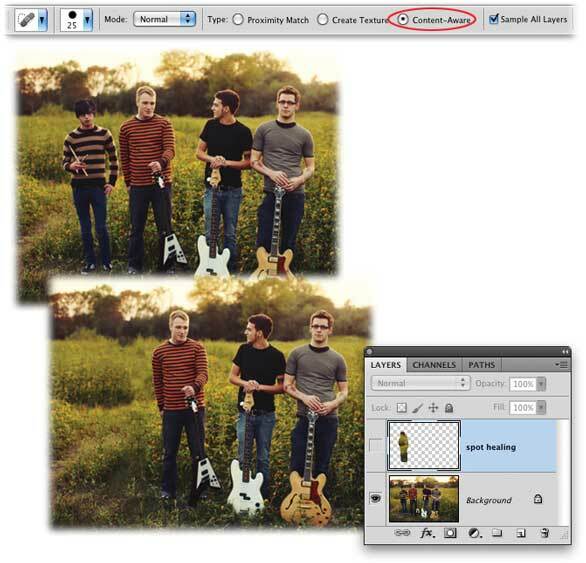 To give you easier access to files through Adobe Bridge, Adobe gave Bridge its own panel inside Photoshop. It’s named Mini Bridge because of its size and the fact that it can’t quite do everything Bridge can (though you can still use full-blown Bridge anytime you want). You can drag files from the Mini Bridge panel into a Photoshop (or InDesign) window. You can also view and search for files, get a full-screen preview by pressing the space bar, and run commands on multiple files. If you ever wondered whether Adobe listens to customer feedback, the proof is in the 100-plus changes that are the direct result of Adobe’s customer feedback initiative, called Just Do It (JDI). 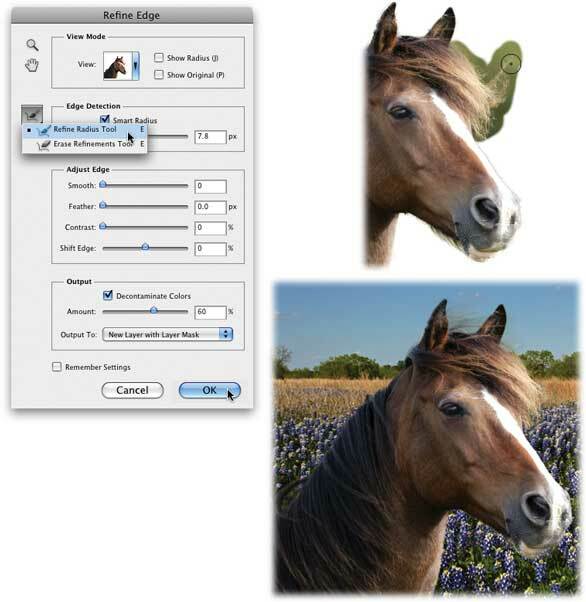 For example, Photoshop now automatically saves 16-bit JPEGs as 8-bit; the Ruler tool includes a Straighten option; the Crop tool includes a rule-of-thirds grid overlay; the Save dialog box includes an “apply to all” checkbox; there’s a preference to turn off gestures on laptop trackpads; there's an option to revert to legacy (CS3) keyboard shortcuts for Channels; the default Shadows/Highlights adjustment is set to 35 percent instead of 50 percent—the list goes on. Layers got a few upgrades, too. For example, you can adjust the opacity and fill of multiple layers at once, nest layers into a deeper folder structure, save your favorite layer style settings as defaults from within the Layer Style dialog box, and drag and drop files from your desktop into an open Photoshop document to add them as a layer. Other additions include a ghosted outline as you drag layer content using the Move tool (helpful when moving small items), visual feedback when you’re dragging layer styles from one layer to another (you see a big, partially transparent fx icon as you drag), and a new Paste Special menu item that lets you do all kinds of neat pasting tricks. Photoshop updates come along every 18 to 24 months, and in this economy, it’s harder than ever to justify the upgrade cost. With Photoshop CS5 and CS5 Extended however, it’s a no-brainer—especially if you skipped CS4. If you work in advertising or graphic design, the new Content-Aware Fill and the improved Refine Edge dialog are worth the upgrade price, not to mention the hundreds of enhancements that will make your editing life easier. If you never work in 3D, you can get away with the standard version of the program and save $300. That said, the extended version makes more sense because it includes extra goodies such as the option to load several images into a Photoshop document automatically (File ->Scripts ->Load Files into Stack), more powerful video editing, animation control, and more. If you’re a photographer, you’ll get more accurate results with the Lens Correction filter; merging multiple exposures now makes more sense and takes less time; and the Camera Raw enhancements mean your photos might not need to spend time in Photoshop at all. With all the time you’ll save by using the new tools, you can give the Mixer Brush a spin and create that painted masterpiece you’ve always wanted.